MANILA, Philippines – The results of the February 2019 Physical Therapists (PT) and Occupational Therapists (OT) board exams including the list of passers, top 10 examinees, top performing schools and related announcements are available at this website as the Professional Regulation Commission (PRC) officially releases the results online two (2) working days after the last day of board examinations. As announced, 772 out of 1,287 passed the Physical Therapist Licensure Examination and 122 out of 211 passed the Occupational Therapist Licensure Examination. The licensure exams are administered by PRC Board of Physical and Occupational Therapy headed by its Chairman, Pollyana G. Escano and members, Raul G. Agustin, Bernadette M. Reyes, Delia R. Pabalan and Rolland Lyle D. Duque on February 3 & 4, 2019 at PRC testing centers in Manila and Cebu. The schedule of online appointment for issuance of Professional ID and Certificate of Registration will be from February 21 to February 26, 2019. As per Resolution No. 1127 series of 2018 entitled "Schedule of Licensure Examination for Year 2019", the target release of February 2019 Physical Therapist (PT) and Occupational Therapist (OT) board exams result will be on February 7, 2019 (Thursday) or two (2) working days after the last day of exams. However, results may also be out earlier or later than the target date without prior notice. On the same board exams administered by PRC on February 2018, August 2017 and February 2017, results were out after two (2) working days while three (3) working days on August 2016 and August 2018. Physical Therapist and Occupational Therapy are among the programs with average number of examinees being administered by PRC. During the most recent PT-OT board exams conducted August 2018, 931 out of 1,379 passed the PT while 209 out of 307 passed the OT. Krisha Marie Gan Badillo from the Riverside College ranked first in the PT exams garnering 89.05% rating followed by Rose Anne Blanco Solde from Pamantasan ng Lungsod ng Maynila having 87.10%. Complete list of topnotchers for August 2018 PT exams are itemized here. In the OT exams, clinching the top spot is Jacette Ortiz Gucor from Velez College garnering 83.60% rating followed by Ma Micah Renea Ferreras Galang from Angeles University Foundation having 83.40%. Complete list of top examinees for August 2018 OT are posted here. Pamantasan ng Lungsod ng Maynila was the top performing school in the PT exams having 96.15% overall passing rate while University of Santo Tomas was the lone top performing school in board exams for Occupational Therapist having 97.18%. Complete details of PT-OT schools performance for August 2018 are posted here. In February 2018 exams, 588 out of 1,017 PT examinees passed while 139 out of 212 passed the OT exams. The next schedule of PT-OT for the Year 2019 will be on August 10 & 11, 2019 in the cities of Manila, Baguio, Cebu and Davao. The online processing will start on May 3, 2019 until July 5, 2019. Good luck everyone! You might also want to know the tips on how to pass the PRC board exams. Get it from the previous examinees and passers. 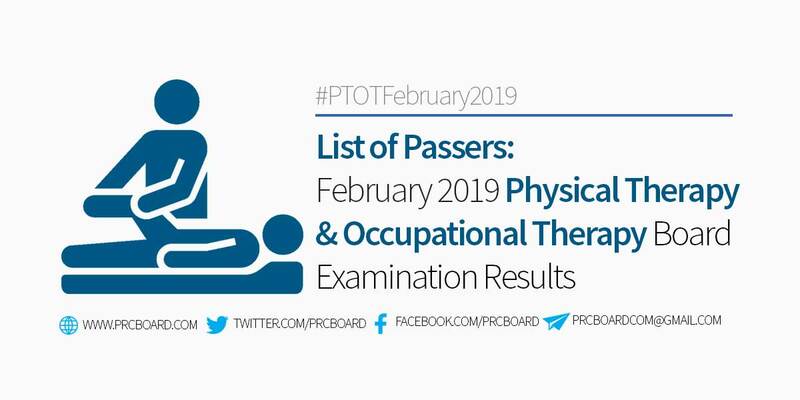 To receive up-to-date news about Physical Therapist and Occupational Therapist results for February 2019, we advise our visitors to bookmark this page, visit PRC official website or follow us at our social media pages via Facebook and Twitter. Good luck to all examinees of Physical Therapist and Occupational Therapist for February 2019! Claim it.. Trust in the Lord and His timing.